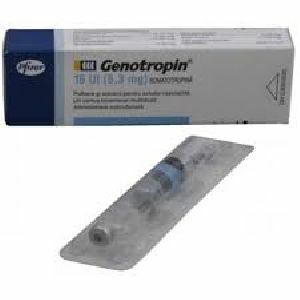 Genotropin 5.3 mg by Pfizer, is an injectable drug containing a Synthetic Growth Hormone (Somatropin) which is a deviate of human GH extracted from human pituitary glands. Genotropin is used for anti aging process, body building and fat loss purposes. Bodybuilders and athletes use it to enhance their exercise performance, muscle mass and their immune system. The positive effects on human body include: the stimulation of cells growth in all the organs of the human body, inducement of protein synthesis or the enhancement of metabolism and increase of the glucose transport. Genotropin is important as well in increasing both calcium retention and the mineralization of bones. Genotropin 5.3 mg is used into 2 doses per day for 6 days a week, with no injections are taken on the 7th day. The doses are prescribed individually, depending on the age and body health of the person. It is recommended to take 8iu per week as often if prescribed by physician, however the most popular dosage is 4iu per day in average. The most common side effects after the use of Genotropin are: acromegaly, fluid retention, enlarged breasts in males, painful joints, carpal tunnel syndrome, and liver damage. It cannot be used by those who have an acute critical illness e.g. open heart surgery, abdominal surgery, multiple accidental trauma or acute respiratory failure.